The MultiOut widget sends multiple values in a single message whenever it receives a value from any of its inputs. The widget can accept input from up to 5 inputs, and assemble those into a single output message composed of all five values, positioned in sequence – e.g. “850 530 194 295 162”. Values in each position are always of the last value for that input. If no input has been received, the value set in the widget by the user is used (and saved for subsequent invocations). This allows you to send output where most values are fixed, but some vary. 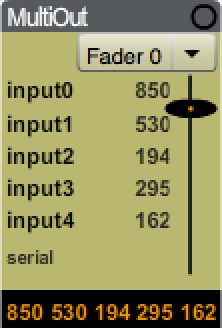 Values are rounded by default, but by unchecking the roundOutput parameter, fractional values can be output, which are often needed for OSC devices that require values in the range of 0.0 – 1.0. To scale values into this range, use a fractional multiplier parameter value such as 0.00097 (1/1023) which will scale values from 0-1023.
default output values – To the right of each input is a number which can be set by the user as a default value that will be sent if no values are received for that input. 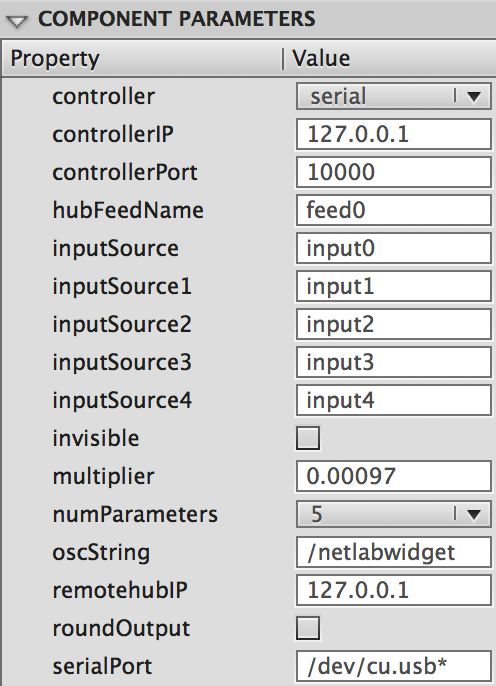 controller – Determines if the multiple value string is sent to OSC, hubFeed or serial. controllerPort – Sets the IP Port used to communicate in combination with the CONTROLLER IP. By default this is 10000.
hubFeedName – The name of the Hub feed we’re creating. hubFeed sends data to the Hub and any other widget or other computer can subscribe to that feed – especially useful when multiple devices are working together. See the Analogin widget for receiving a hub feed (use the controllerInputNum to select which of the MultiOut’s feeds you want), and the HubFeed tutorial. inputSource – inputSource4 – The instance name of the source the widget listens to, e.g AnalogIn, for each of the 5 inputs. multiplier – Value is multiplied to all input values received. To provide the appropriate numbers for the output to the device/software the toolkit numbers may need to be scaled to the appropriate fractional numbers. E.g. set the multiplier to 0.001 to change numbers in the range 0-1000 to a range of 0.0-1.0. To be more precise for numbers ranging from 0-1023, use a multiplier of 0.00097.
numParameters – Sets how many of the inputs are sent in the output string to the selected device. remoteHubIP – This sets the IP address of the Hub where the widget will send values to a microcontroller. Normally this would be 127.0.0.1 for the Hub running locally. But if you want to send values to a Hub and microcontroller running on a remote computer, change this IP to the address of the remote computer. In this way, widgets on multiple computers can a microcontroller on a remote computer with outputs attached. Note that even if you are using a remote Hub, the Hub application must also be running locally on the same machine as the widgets. Also applies to a hubFeed. roundOutput – Rounds any input values to integers. Useful when your device can’t accommodate decimal fractions. serialPort – The USB serial port name that the device is connected to. On the Mac connected to an Arduino, you can leave the default (/dev/cu.usb*) if only one device is hooked up (for device other than an Arduino, check the Hub listing of serial devices to see the name of your serial device). On the PC, replace this with the COM port used, e.g. COM7. For more detailed info on how to set this parameter, see the common features for all widgets discussion here.